We each assume we know what respect is, based on our personal experiences. Caregivers and teachers spend a lot of time emphasizing signs of respect. I often encourage my young daughter to say “Good morning!” and “Please” and “Thank you.” I remind her about holding doors open for others, letting others help themselves first at a meal or get on the elevator first, telling people what she appreciates about them, and writing thank-you notes. Others reinforce my teachings by praising my daughter for her polite and respectful behavior. She experiences the benefit of being respectful. I’m confident that she will continue such behavior as she becomes an adult. She may also teach her children similar acts of respect. However, not every child learns the same behaviors. Different actions are emphasized in different households and neighborhoods, depending on what seems most important—time and energy permitting. 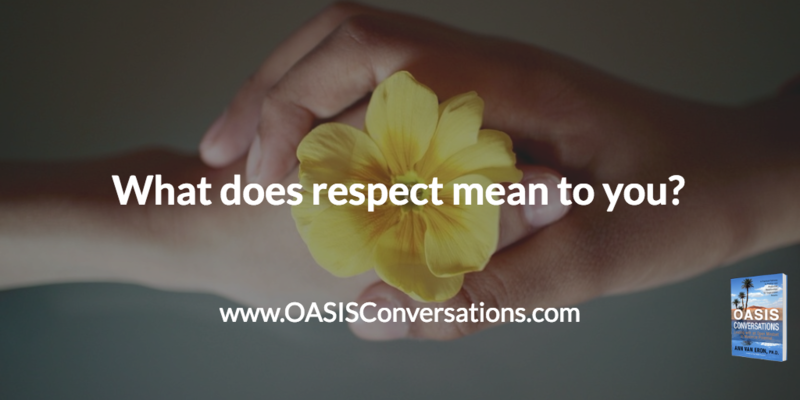 We need to appreciate that different forms of respect are emphasized in different families, communities, and cultures. For example, Nisha, who is from India, always brings a gift when visiting. The golden rule has been taught in our schools and churches: “Treat others how you want to be treated.” Actually, we need to “treat others how they want to be treated.” I remember when a friend was very excited about the gift he had bought his wife for a holiday. He told me it was a set of car tires! That, by the way, was the very thing he had said he would love to receive. Reports were that she was not as excited about the tires as he was. To respect another person, first have the intent to be respectful. We need to make an effort to see the person as a unique individual. Then we need to consider what is most important and what would best meet the other’s needs. We can gather this information from observation or asking that person or others close to him or her. After taking action, we need to pay attention and observe whether the person receives it as a sign of respect, as we intended. If not, we can have an open-minded conversation to learn more and determine what to do next. Contact us at www.Potentials.com to tell us what respect means for you. This entry was posted in Communication, intention, Mindfulness, Perspective by Ann Van Eron. Bookmark the permalink.